I have a Logitech Anywhere Mouse MX and I like to set the scrollwheel to send the Internet Back signal when I push it to the left and Internet Next when I push it to the right. On several installations on Windows 7 SetPoint wouldn’t remember these settings between reboots and it slowly drove me insane. I tried installing the 64bit version of SetPoint and the 32bit version but it didn’t help. A whole lot of other things didn’t help as well. 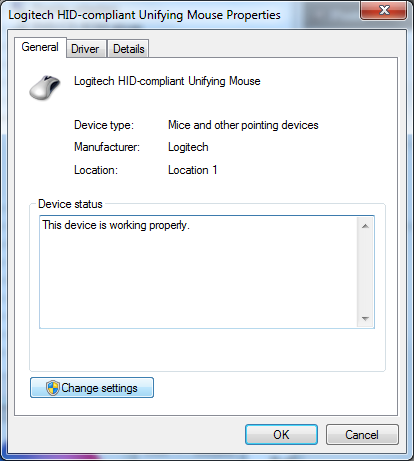 The Device Manager showed me there are two identical Logitech HID-compliant Unifying Mouse devices. Right-click one and open the Properties. On the General tab, click Change settings. 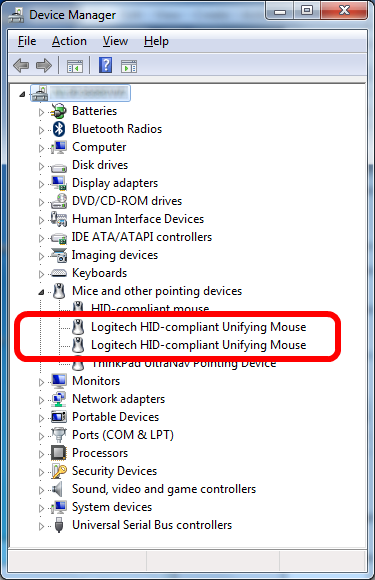 In the Logitech HID-compliant Unifying Mouse Properties window, click the Driver tab and click the Disable button. If your Disable button is greyed out it is because you didn’t click the Change settings button in the previous step. This will either fix the problem or instantly disable your Logitech Mouse. 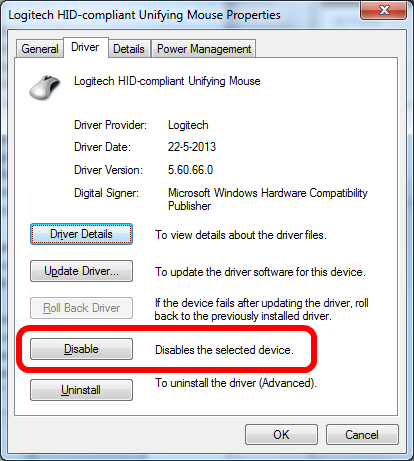 If it disables your mouse, just Enable the driver again and disable the other Logitech HID-compliant Unifying Mouse. Thank god. Worked successfully at me. Great. worked just fine and even restored the lost setting. I use M705 with setpoint windows 10.
the problem happened when I introduced my new mouse MX master with its new dongle receiver. This fixed a problem with my Performance MX mouse on Win 7 not retaining it’s settings in the user.xml file. I have two wireless mice for this single receiver so had to go through the steps twice to find out which entry was for each mouse and disable any other Logitech device. Works perfectly now. Thank you!!! My guess why this happens is each receiver retains all of the mice ever linked/paired to it and loads them as a device in case they are ever used. Not sure what determines which device gets its setting saved. Perhaps the first one in the list? My Performance MX mouse was the first entry and listed as Location 1 so… Regardless, disabling unused entries seems to resolve the problem. Wow thanks so much for this. If only Logitech actually told all their customers this instead of the 100 years old boilerplate “Do a clean install” answer, there would be so much less frustration for everyone. THANK YOU ! I was having a hard time and it was driving me mad!!! I am so sad that this fix didn’t work for me. I have edited my user.xml basically so that I could get button 4 and 5 on the side of the mouse to emulate Ctrl + Win + arrow to shift virtual screens (trust me it’s amazing!). However, the exceptions to buttons 4 and 5 in Office applications reset themselves every time i start up or restart setpoint. SOOOO annoying, and although I found a hidden duplicate device, after removing it I STILL have the problem mentioned above. Shame. The exception rules mean that, annoyingly, I cannot shift virtual screen if it so happens that Outlook or Word or Excel etc. are in focus at the time I press the buttons. You can override the settings using the Setpoint software and the overrides work, but get reset EVERY restart!! aaaaaaaagh. Great tip nonetheless, well done on finding it. I have mailed Logitech, I hope they can help! Please read first and then comment. At last a solution! Worked for me on Win 10 and an M705 mouse. Works for my M705 seven button mouse. Five buttons have custom Keystroke Assignments, so losing them a few times before I found your solution was doing my head in. I’m thinking I’ll name my first born after you. Solved!! Thanks you very very much. It should be working if you have only a mouse. But if you are using a remote mouse and keyboard together, disabling the non-mouse device actually disables your keyboard. This page is the gift that keeps on giving. Thank you Kepitein Vorkbaard. I can’t believe this worked after 6 years. The original answer was in 2013 and I honestly didn’t think it would work anymore after different versions and updates, etc. I’m running Win 10 ver 1809 with a Logitech M560. The only difference is the names in device manager are different. I have Logitech HID – compliant unifying mouse and HID – compliant mouse. I just disabled the HID – compliant mouse setting and after a reboot the settings stayed. You’re a genius Kapitein Vorkbaard! Thank you! I dont have 2 drivers but it worked when I disabled and enabled the only one. Thank you!